Not only does Ricardo overlook the point made earlier that the market for commodities is made up not just of capitalists and workers, but also of other classes, he also fails to take into account, despite his earlier comment, in respect of crises and fixed capital, that once production becomes based upon this large-scale machine industry, other regulations come into play that govern minimum efficient levels of output etc. “... he overlooks that in reality, where not only the capitalist confronts the workman, but capitalist, workman, landlord, moneyed interest, [people receiving] fixed incomes from the state etc., confront one another, the fall in the prices of commodities which hits both the industrial capitalist and the workman, benefits the other classes. And this, as Marx and Engels repeat in numerous places, is the key to understanding the crisis of overproduction, and why, despite 400 years of developing capitalist production, from the 15th century on, it is only in 1825, when large-scale machine industry has taken hold, that the first crisis of overproduction arises. In all petty commodity production and capitalist handicraft industry, the four potential causes of crisis, identified by Marx exist. That is that the commodity itself is both use value and exchange value; production and consumption are separated; money acts as both means of circulation and means of payment; and the potential for a disproportion in supply of different commodities arises. Yet, crises of overproduction do not arise in these earlier forms of capitalism, and commodity production. The reason is that, even in terms of capitalist manufacture, i.e. production based essentially on handicraft production, rather than machine production, output expands only more or less in line with the expansion of the population, and so of the market. Machine production changed all that. The machines themselves are continually revolutionised, output rises by multiples overnight, and the production itself can only be justified by being undertaken on a huge scale, which must be continuous, and must be ahead of consumption. 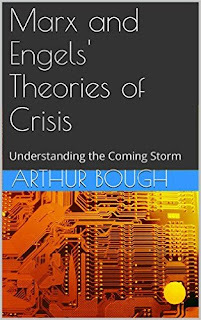 The potential of crisis, resulting from the separation of production and consumption, becomes the inevitability of crisis once the production expands so much faster than the market that the output, having been produced, cannot find buyers at prices that cover the cost of production. As production expands, more workers are employed, the demand for labour-power begins to exceed the supply, so wages rise, and profits are squeezed. The workers, with their higher wages, consume more of the mass produced products, but that only means that their demand for these commodities becomes more quickly sated. They could buy more, but have no desire to do so. And, it is not just workers in this position. As the market prices of these commodities are driven down, the cheaper they become for the landlord or money lender, relative to their rent and interest payments, and so the more quickly is their own demand sated, whilst this also represents a transfer of surplus value from capital to the landlord and money lender. I have set out these arguments in much more detail in my book – Marx and Engels' Theories of Crisis.